It’s the great debate …. Should we or should we not take our kids out of school to visit Walt Disney World?? If we wait until summer break, there will be larger crowds and it’ll be HOT! If we go during the school year, it’s generally cheaper, the crowds are smaller, and the weather cooler ….BUT do we let them miss school? Is there a way we can make our family trip to Walt Disney World more educational? As a mom of 4, with 3 in elementary school, I can tell you we take our kids out of school at least twice a year for our family trips to Disney World. Here are some great tips on how to focus on the educational aspects of your trip while still keeping it magical. WORKBOOKS – My kids love the Walt Disney World Adventure: A Field Guide and Activity Book for Explorers. It is best suited for ages 6 through 10. This workbook is broken down by individual attractions. Each attraction has its own activity to do ranging from mazes to decrypting secret codes. It is perfect for down times and while waiting in line. DISNEY’S YES PROGRAM – Disney’s Youth Education Series gives students a hands on educational adventure! While first a program for homeschoolers and groups of 10+, Disney often opens up classes to individual children from grade school to high school. Topics include Environmental Studies, Applied Sciences, Liberal Arts and Leadership Development. My 6 year old daughter took the course entitled Experiencing Synergy in Science. One adult was able to attend with her. This class took place inside of EPCOT. The course was very kid friendly and they all got to go behind the scenes in the Imagination Pavilion. Both Daddy and daughter had a blast on this 4 hour adventure! TOURS – Walt Disney World has a variety of tours available to choose from. One of my favorite educational tours is the Behind The Seeds Tour at the Land Pavilion. It is inexpensive ($16 child, $20 adult), about 45-60 minutes long and appeals to all ages. We did this tour with our preschooler and 1st grader as well as with the grandparents. It was so neat to go behind the scenes of the Living with the Land ride, entering the labs and walking through the green houses. We were able to feed the hybrid fish, check out the alligator tank, taste fresh food, release ladybugs and learn about how the “good” bugs eat the “bad” bugs. The kids were fascinated with how they could make fruit into the shape of Mickey! For animal lovers, the other educational tour I would recommend for older children would be the 3 hour Wild Africa Trek offered at Animal Kingdom. Magic Kingdom : Relive the dramatic history of the United States of America at the Hall of Presidents. Experience American Literature by exploring Tom Sawyers Island or World Literature at Swiss Family Robinson Tree House. At It’s A Small World, talk with your children about World Cultures and Geography. My favorite is discussing how advancing technologies affected the American family over the 20th century on The Carousel of Progress. EPCOT : Besides the obvious science and history in Spaceship Earth and Ellen’s Energy Adventure, there are many less obvious educational experiences in this park. For little ones, be sure to ride Journey Into Imagination and talk about the 5 senses. For older kids, teach them how the 3d effect works at the Disney and Pixar Short Film Festival. All ages will enjoy stopping by Club Cool and tasting Cokes from around the world. Discuss with your kids why they think Coca-Cola has different flavors in each country (regional palates, local resources, infrastructure, transportation costs). For fish lovers, check out the 2nd largest salt water aquarium in the world at The Seas with Nemo and Friends. It is actually a working underwater research facility! Living with the Land can spark countless conversations about how we can grow our own foods, conserve resources and learn about synergy in nature. Our family’s favorite at EPCOT is traveling with the kiddos around World Showcase. Each cast member in their respective pavilions are here visiting from their home country. We love to come up with a topic and ask the same question to a cast member at each pavilion to compare and contrast different cultures. For example, if you are visiting World Showcase during the Christmas holiday, have your children ask a cast member in each country about their holiday traditions. Older children can even keep a journal. Hollywood Studios : This park was once a working movie studio. There are several learning opportunities here. Kids can learn about American culture with classic movie history on The Great Movie Ride. At Voyage of the Little Mermaid, talk about how black lights work on the neon puppets or ask your child to retell the story with a beginning, middle and end. On Toy Story Mania, show them how math can get them a better score by choosing to hit the targets with bigger numbers. Compare scores at the end (which is bigger? smaller? difference?) or ask them to round up their score to the nearest hundred. Animal Kingdom : This is by far Disney’s largest park and has so much to offer from an educational standpoint. When you enter each country, have your child look it up on a world map. Look around at the details in each country to see the differences in plants, building structures, music, etc. On Kilimanjaro Safari, learn about the endangered white rhino along with numerous other animals. Take a train up to Rafiki’s Planet Watch where you can learn how they care for the animals and how you can help through conservation. There is also a fun petting zoo area here where you can brush billy goats and pet a donkey. 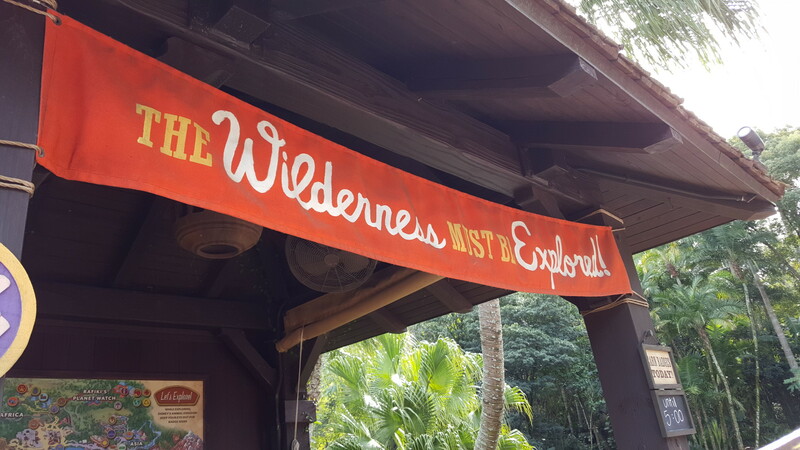 For a more structured learning experience, be sure to join the Wilderness Explorers near the entrance of the park. After joining, your little one will be given a journal packed with dozens of activities. Each activity can be done at it’s matching station around the park. When the activity is complete, your little one earns a “badge” (sticker) to place in their journal on that page. Activities include matching up dinosaur bones, scavenger hunts, mimicking drum rhythms, cracking secret codes, animal observations and learning about different cultures. SAFETY – Use the time at the beginning of your vacation to teach your young ones about safety. Go over what to do if they get lost including finding the nearest cast member. Have them recite their name and phone number. Teach them how to be aware of what is going on around them and to stay close. These are great skills for preschoolers to practice! MANNERS, MANNERS, MANNERS! – Learning social skills is part of education and manners are a super important social skill that takes practice, especially at Disney World. Often times we as adults can get stressed out but these precious little ones are looking to us to set the example. Every where you turn you can teach by example and even talk about why we act the way we do. Hold the door open for others. Say please and thank you. Give your seat up to the elderly or to a pregnant mommy. Watch where you are walking and teach your kiddos to do the same. When dining at a quick service restaurant or just on the go, be sure to clean up after yourself. Teach your child how important it is to be responsible for their own trash and to take care of this beautiful place. LOOK FOR TEACHABLE MOMENTS – Education doesn’t always come in a lesson plan. Sometimes the best lessons are learned through life experiences. Slow down and look around. Intentionally converse with your child and ask them questions about their surroundings. Is this rock smooth or bumpy? What colors are the flowers? Do you see something red? What do you smell? What do you think that sound is? Can you find me a letter B? Why do we have to wash our hands? For older kids, give them the park map and have them navigate to the next attraction. Teach them how to make change when purchasing their Mickey Ice-cream Bar. Give them a $10 allowance for a souvenir and guide them in making a good choice. Tell them what time it is and ask them how much longer until the 3 o’clock parade. When dining, talk about healthy food choices. The sky is the limit! As you can see there are so many different ways to intentionally and unintentionally have an educational trip to Walt Disney World. The best part of it is that the kids usually have no idea that they are learning! Every trip and every age brings new learning experiences. Would you like to learn more about planning your own educational trip to Disney? Have some great ideas to share? Contact me today by email at Nikki@MickeyTravels.com or through my Facebook page here. I would love to help you plan your next Walt Disney World vacation!